monetary investment opportunities for individuals with a promise of a return on their investment. This is a problem, because Wakaya Perfection aren’t registered to offer securities in the US. Plaintiffs Essence Skin Clinic and owner Jennifer Sanneman (right), allege Wakaya Perfection committed securities fraud over November and December 2016. Sanneman claims to have been contacted by Barb Pitcock in September 2016. By the end of the month Sanneman had signed up as a Wakaya Perfection affiliate under Pitcock’s downline. In or around November 2016, Barb Pitclock traveled to Minnesota to educate Wakaya’s Ambassadors about Wakaya and how to build their Wakaya business. At this time, Barb Pitcock was already aware of Sanneman owning her own skin care line and skin care business (Essence Skin Clinic). On or about November 8, 2016, Barb Pitcock told Sanneman that Wakaya needed her skin care line. Barb Pitcock also told Sanneman she wanted to introduce Sanneman to William J. Andreoli, President of Wakaya. Between November 8, 2016 and December 28, 2016, Sanneman engaged in negotiations with Wakaya and its representatives as to her potentially being an investor in Wakaya. Wakaya was actively soliciting a $250,000 investment from (Essence Skin Clinic and Sanneman) during this time period. 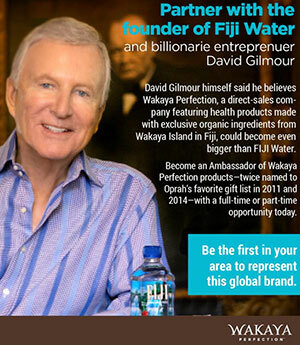 backed by a billionaire who had founded the Fiji Water company and owned the tropical island Wakaya. Wakaya’s promotional materials also appropriated the billionaire’s image and likeness to create the impression that the billionaire financially backed Wakaya. Barb Pitcock also told Sanneman that Wakaya was debt free. Sanneman alleges that based on these representations, she ‘decided to invest in Wakaya‘. Sanneman entered into an “endorsement agreement” on or about December 28th, 2016. The endorsement agreement required Sanneman to license her image, name, likeness, and voice for commercial purposes to Wakaya … as a Wakaya Brand Ambassador in exchange for compensation. invest a sum of $250,000 with Wakaya for the purpose of product development, procurement, marketing and operational expenses. Sanneman was to receive 5% of actual sale price on specific Sanneman branded, Sanneman endorsed, or other specified products. If an Essence Clinic or Sanneman product was a part of a package to be sold, then Sanneman was to be paid on “proportionate portion of sales price the entire package” [sic]. The compensation schedule also called for the revenue share for Sanneman to be increased from 5% to 20% until Sanneman received cumulative royalty payments equal to $500,00, providing a 50% return on investment. Sanneman invested $250,000 in Wakaya Perfection, as per the endorsement agreement, on December 28th, 2016. Sanneman’s securities fraud allegations begin with her not being advised that at the time of her investment, Wakaya Perfection had been sued by Youngevity International. Sanneman claims Wakaya Perfection “intentionally withheld critical information” regarding Youngevity’s lawsuit while they were trying to get her to invest. would not have invested $250,000 into Wakaya if (she) had known about the ongoing federal lawsuit. a billionaire was a partner and financial supporter of Wakaya (with the aim of) deceiv(ing Sanneman) into believing Wakaya was financially stable. The billionaire is neither a partner in nor an owner of Wakaya. Although not named in Sanneman’s lawsuit, I believe the billionaire in question is David Gilmour. 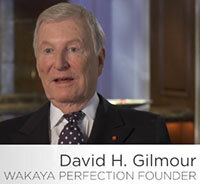 I’m a bit confused over Sanneman’s claims Gilmour is neither an owner nor partner, as to this day Gilmour is credited as founder of the company on the Wakaya Perfection website. Gilmour is not a defendant in Sanneman’s lawsuit. Wakaya Perfection’s products were also a point of contention between Sanneman and the company. Wakaya required Sanneman to promote Wakaya products with no verification of the safety of the products, where the products came from or how the products were bottled. Sanneman singles out essential oils manufactured by VEO Oils in Kansas, a company owned by defendants Dave and Barb Pitcock. Wakaya also required Sanneman to promote products like Dilo Oil and Aloe as coming from Fiji despite that being factually false. skin care products arriving to Wakaya ambassadors and customers damaged, which led to decreased profits. Since her $250,000 investment two years ago, Wakaya Perfection has only paid Sanneman $41,333. Sanneman issued Wakaya Perfection with a recission offer on August 10th, which as of October the company had not accepted. Nor had Wakaya Perfection repaid Sanneman’s $250,000 “securities investment”, prompting her October 24th lawsuit. Named defendants in Sanneman’s lawsuit are Wakaya Perfection, Todd Smith, William J. Andreoli, Blake Graham, Andre Vaughn, Steve Smith, Barb Pitcock, Dave Pitcock, Patti Gardner, Mike Randolph, Mike Casperson and Brytt Cloward. Sanneman and Essence Skin Care are suing for violations of the Minnesota Uniform Securities Act, breach of contract, fraud, promissory estoppel and unjust enrichment. Personally I’m in two minds about lawsuits like this. Effectively Sanneman was given a secret backroom deal. Wakaya Perfection aren’t registered to offer securities anywhere in the US, so it appears securities fraud would have been committed regardless of whether Sanneman filed her lawsuit or not. Would Wakaya’s alleged securities fraud be public knowledge had Sanneman have been paid as per the terms of her unregistered securities contract? At the very least Sanneman is entitled to some of her investment back, perhaps sans harm to consumers by way of her lying to them and misrepresenting Wakaya Perfection and its products on their behalf. Although how the court would calculate that harm in a dollar sense I have no idea. So it seems there’s a clear-cut case for either the SEC or Minnesota Department of Commerce to pursue. Not withstanding the likely possibility that Wakaya Perfection has made unregistered securities offerings to other parties. The Pitcocks and their VEO Oils company come to mind. No word on whether either agency are investigating. As per the case docket, a Motion to Dismiss for lack of jurisdiction or in the alternative compel arbitration was filed by the Wakaya defendants on October 31st. Me Coin Review: 39.71% a month bitcoin trading ROI?